Childhood obesity is at an all time high with 1 in 3 children being obese or overweight; parents may be wondering what kind of training program is appropriate for children. Check out these workout guidelines that make exercise safe for kids. The first thing that you must remember when planning a workout routine for your son or daughter is that kids are not miniature adults, and can’t be treated as such in regards to safe and effective workouts. In fact, inappropriate training can damage growth cartilage. Advice from professionals is key when planning a workout for your child, so make sure not to just seek the advice of your pediatrician, but also a qualified training professional. This way, you know you won’t make any mistakes. Another good idea to keep workouts safe for children is to make sure you participate. If you’re there watching, you’ll know if your child is making any mistakes that could be potentially damaging. Keep the sessions short and make sure that you include a warm-up and stretching. Try strength training exercises, but don’t immediately include any weight. You should begin by doing 8-10 strength exercises per session. Each exercise should include 13-15 reps per set, but don’t do more than 1 set per exercise. When the child can easily 15 reps of a particular strength exercise, you should allow them to add weight, but no more than 1-3 pound increments at a time. Getting a child to workout consistently can be difficult; the best way to make sure your child sticks to it is to make sure to keep the atmosphere fun and non-competitive. 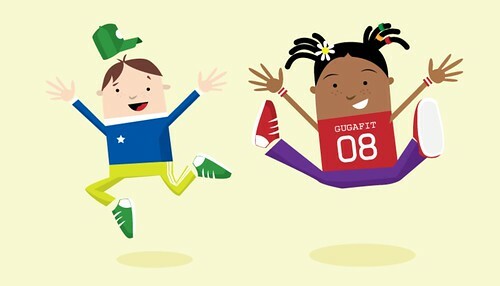 For example, when warming up choose activities that a child might enjoy like marching, jumping jacks, or foot races. If the child isn’t interested in these types of warm-ups, allow him or her to suggest some. You must remember to not allow a child to over train, or you’ll risk the progression of normal physical development. As with all workout programs, choose an appropriate diet and make sure the child gets plenty of sleep. Any workout for a child who has not yet reached adolescence should be carefully balanced to include equal amounts of strength training and aerobic exercise. Keep your approach conservative and remember to have fun…Your child won’t just become fit, but he or she will have a great time doing it! Keep in mind that all diet and exercise programs for children, teens, or adults should be supervised by a physician. Now go plan a routine that will help you become fit as a family!